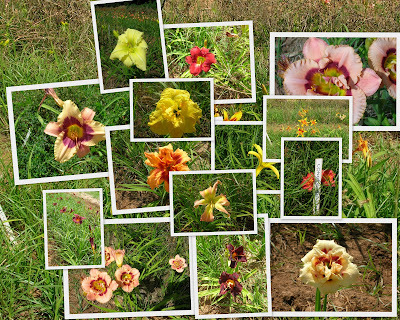 Visit to Iris En Provence to see the day lilies in flower. 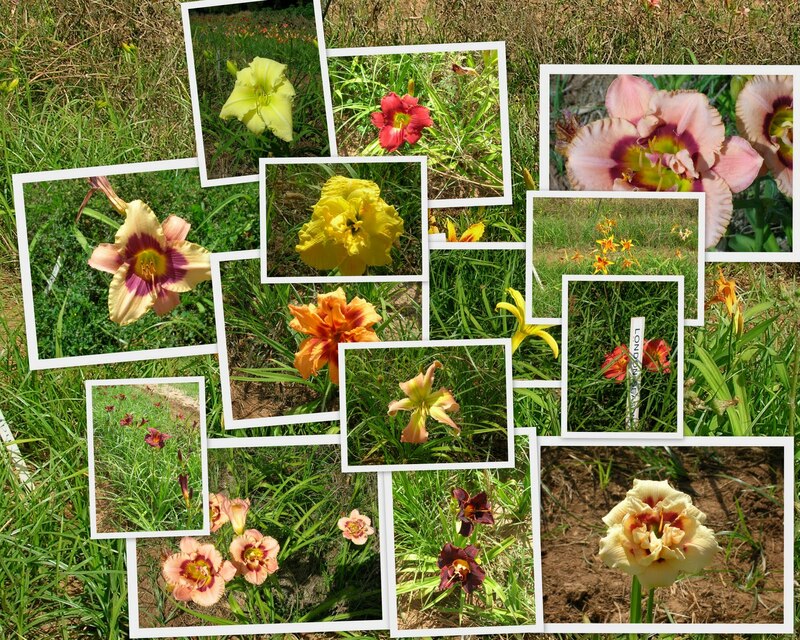 Just four members (with no visitors to collect from the airport) made it to the peage carpark on Friday, 24th June, for the short journey to Iris En Provence, Hyeres to see the day lilies in flower. This is a small family-run professional nursery with iris and hermerocallis growing outdoors and various vegetable crops growing in plastic tunnels. The day lilies were fighting for space with thistles and weeds and perhaps this was why they seemed smaller than the heights given in the brochure. 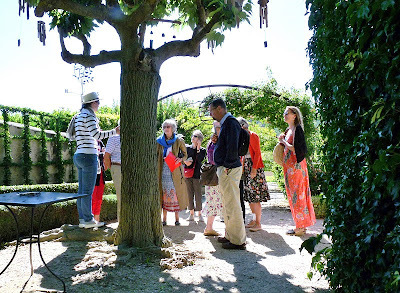 It was also difficult to identify some of the varieties which did not seem to be listed in the catalogue and we discovered at the end of our visit that their website contains more varieties than the brochure! C'est la vie . . . . We were not tempted to buy any plants, many were not in flower and all looked rather uncared for and needed the dead leaves removing. There are two basic groups of colours, the yellows and oranges or the reds and pinks, and my vote is to go for the evergreen varieties and those that flower more than once. 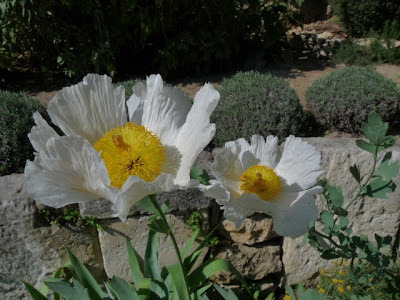 I have also realised that in the hot sun of Provence the subtle blush pinks or pale creamy yellows are lost amongst other plants and need to be planted in a pot kept near the house in order to be seen close up. At 11.45am we headed briskly to the town centre for the sacred two hours of lunch starting promptly at 12 noon, after which we allowed ourselves an inspection of what the shops had to offer. The centre of Hyeres is reasonably compact with some beautiful bourgeoise appartment buildings and tropical palm trees lining the streets. The dual carriageway approach to Hyeres from the A8 autoroute in June is a horticultural delight (eat your heart out, Promenade des Anglais, Nice!) with stunning mass planting of lantana, oleander, plumbago, perovskia, bourgainvillea - most of which we can't grow in Centre Var because of frost. We rounded off our visit with a quick swim on the beach of the Presque Ile de Gien and afterwards located an even better beach backed by shady pine trees which we'll try on our next visit. After our night stop in Bonnieux, Rosemary, Sue and I made our way to Anduze. The traffic was very heavy especially around Avignon, which delayed us. In the end there was not enough time for our planned morning visit to the Bambouseraie as we were meeting up for lunch with Jacqueline & Jeremy in a restaurant close to the Bambouseraie. After lunch we had booked a visit to the pottery "Le Chene Vert". 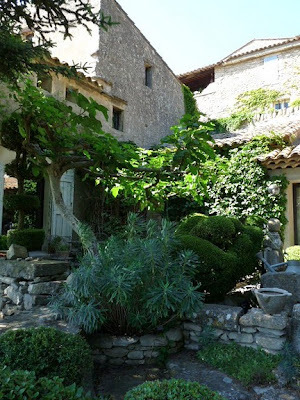 La Poterie "Le Chene Vert" makes large garden pots in the old Anduze style, traditional olive jars from Biot and the normal assortment of glazed flower pots, dishes and other objects. The pottery is run by a brother and sister team. The brother occupies himself with the actual creation of the pots, whilst the sister runs the business side of the company. She explained to us how the different pots were made. The smaller items are made by hand, they have just 1 potter, who makes all the smaller items. For the "Vase d'Anduze", they use a mould. After the clay has dried, small blemeshes are smoothed out and the embellishments are added. Each pot has a date and signature of the potter on the bottom. They are then glazed and fired. The third method consists of a shape made out of wood, a rope is twirled around it and handfuls of clay are thrown on to the rope. When the rope shape is covered in clay and smoothed out, it is left to dry. After drying the rope is carefully removed. The reason why a rope method is used instead of a mould is that the moulds are rather expensive, don't last all that long and you can only make one type of pot with one particular mould. With the rope method, you can create different designs, and it is inexpensive. 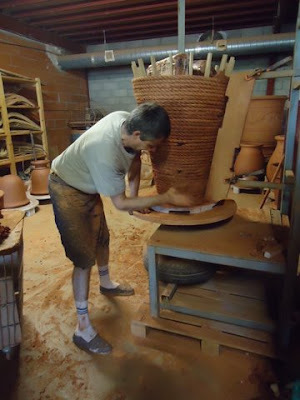 You can always recognise a pot made by the rope method, because it has the imprint of the rope inside the pot. 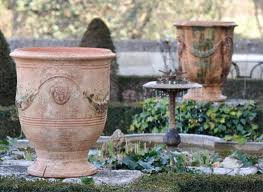 The large Anduze vases are beautiful, they come in many different sizes, patterns, colours but are quite expensive. They are not 100% frost proof, the advise is to take them inside in the winter. 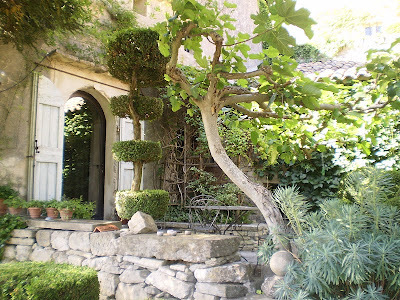 After the Poterie, we made our way to the Bambouseraie. 1890 : on Eugène Mazel’s death, the garden was taken over by the Crédit Foncier. 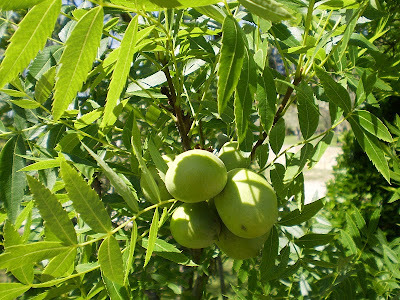 1956 : a heavy frost resulted in the disappearance of large numbers of plantations. The bamboo plants and the trees were the only plants that resisted. 1960 : Janine Nègre continued the work of her deceased husband. In 1977 she handed down the estate to her daughter Muriel, who, with her husband, continued to develop it. 2000 : Year of the Dragon, Erik borja presented the Dragon Valley project. 2004 : Muriel Nègre took over the sole management of the estate and made the Bambouseraie a sharing- and meeting-place. 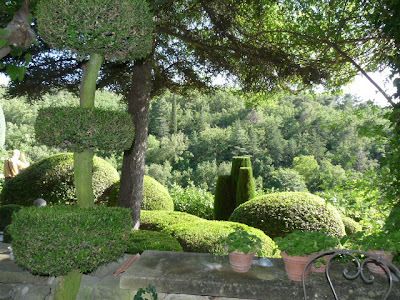 2005 : the Ministry of Culture granted the Bambouseraie classification as a Remarkable Garden. 2008 : the Bambouseraie was registered as a Historical Monument. Phyllostachys group: (Phyllostachys, Brachystachyum, Semiarundinaria, Sinobambusa, Chimonobambus and Shibataea) mostly tall bamboo's with a creeping rhizome. 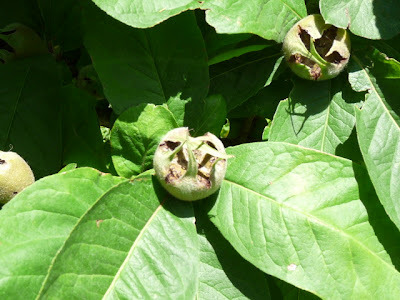 On the rhizome are buds, some for new roots, some for new shoots. Sasa group: (Sasa, Sasaella, Pseudosasa, Pleioblastus, Indocalamus, xPhyllosasa, low to high bamboos with the same creeping rhizome as the Phyllostachys group. Fargesia, Thamnocalamus, Drepanostachyum and Yushania, medium to high bamboos with sod/turf forming rhizomes. 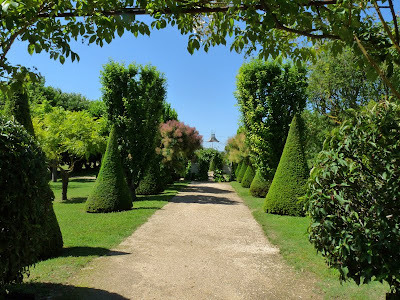 As you enter the Bambouseraie, a lane stretches out in front of you with on either side Phyllostachys bamboo's, interspersed with Sequoia sempervirens trees. In its natural habitat the Sequoia (California, Oregon) reaches 110 meters in height, here just 48 meters. For such a tall tree it has a very small pine cone, the size of a 1 euro piece. A turn off of the central lane brings you to a Laotien village, completely built out of different kinds of bamboo. Buildings made out of bamboo do not last forever, after about 10 years it needs to be rebuilt. It was interesting to see the different sizes used in the building, each one having a purpose in the construction. Before the bamboo shoot surfaces, the width of the bamboo has already been decided. It will grow in height but not in width. The bamboo grows for 3 months in a year. A normal bamboo grows between 10-30cm, depending on how much water it receives. 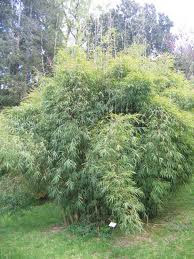 The fastest growing bamboo, Bambusa oldhamii, orginally from Taiwan, grows up to 1 metre a day. As the bamboo emerges from the ground the bamboo shoot is covered by a sheath, which eventually drops off. The taller the bamboo becomes the larger the space between the nodes. Bamboo roots go 6-65 cm deep and creep unlimited if not restricted. Consequently they are considered to be very strong and in countries where bamboo grows and where earthquakes occur, the inhabitants flee to a bamboo for protection. Bamboo absorbs CO2, twice more than trees. Besides Bamboo there are lots of interesting, mature trees in the Bambouseraie. Magnificent Gingko biloba's. The Gingko can live for 4000 years, it has existed on the earth for the last 250 million years, does not burn in a fire and can cope in heavy polluted areas. It survived Hiroshima. 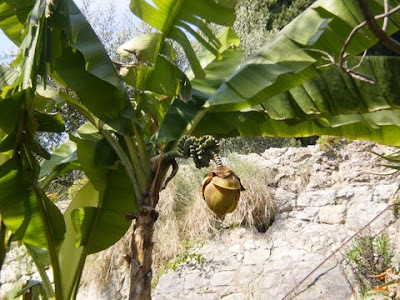 Musa bajoo (Banana tree) takes 3 years to flower, above ground parts can take up to -10 degrees Celcius, roots up to -15 degrees Celcius. Yushanya bolana is a clumping bamboo. For the people who are planning to plant a bamboo, read the article below. The key to successful bamboo control is learning how to prune the rhizomes. Removing shoots and canes above ground level merely hides the evidence; it does not prevent spreading. Although plastic Rhizome Barrier is now used extensively and sold by many vendors, including us, we believe root pruning should be the first option. Any bamboo grower should familiarize themselves with basic root pruning techniques, even if using barrier. Providing a thorough education is one of our top priorities. We believe anyone who sells bamboo has an obligation to give clear and accurate information about the nature of bamboo and how to master it. Consider the following proactive methods for taming bamboo. Bi-annual root pruning around the edge of a running bamboo is the most effective way to achieve long-term control. Fortunately, rhizomes are usually very shallow rooted and prefer to grow in loose topsoil 2-5 inches beneath the surface. Root pruning is achieved by working around the bamboo with a sharp spade, driving it into the ground and removing the wayward rhizome. One can generally feel the rhizome as the spade cuts it. 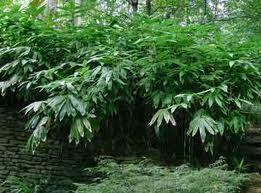 The rhizome can be cut back to about two feet from the parent plant, or to wherever bamboo growth is desired. It is necessary to leave some rhizome attached so that the bamboo can produce healthy new shoots in the spring. Cut off and completely remove the rhizomes that are discovered outside of their designated area. Small segments of rhizomes can rejuvenate so make sure to be thorough. 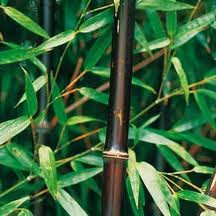 The smaller, leftover feeder-roots will not grow into new bamboo plants. A ripper on the back of a tractor works well for edging long distances. Although digging rhizomes seems challenging, with careful planning, conditions can be created that simplify this task. One can maintain a shallow trench (8-12 inches deep by 12 inches wide) to control the spread of rhizomes. Check for creeping rhizomes a couple of times in the late summer and early fall to see if any of them have tried to cross the trench. If so, cut and remove them. After doing this a few times one learns where the rhizomes are most likely to be, and therefore, where to check more frequently. Because rhizomes are shallow, they often poke out the side of the trench. If a trench is impractical for the area, it can be filled with a loose media, such as sand, which is easy to dig into for root cutting. If one side is inaccessible for pruning, one can install an open-sided barrier and root prune along the edge that is easy to access. Planting bamboo on berms or in raised beds is useful because the loose, rich topsoil provides a healthy growing area and the rhizome can predictably be found in the upper layer. 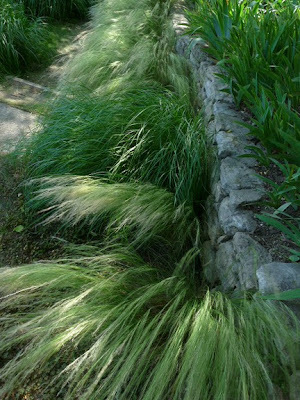 Once the rhizome comes out of the edge of the berm it can be easily found and cut. Loose topsoil makes it easy to remove long runners. Bamboo has difficulty running down a slope or over a ledge and often exposes itself in the process. The use of river rock or pebbles to decorate the ground beneath the bamboo is not advised. Fallen leaves will quickly cover them and ultimately the bamboo roots will engulf them. This makes root pruning or digging in the future much more difficult. Tools will blunt and break against rocks. 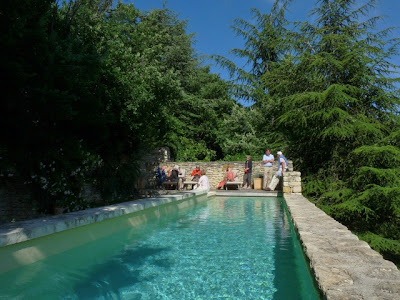 After our visit to Chateau Val Joanis, our group had lunch in Cucuron, a village made famous in the film "A Good Year", featuring Russell Crow, not too far from our next venue "Jardin La Louve". 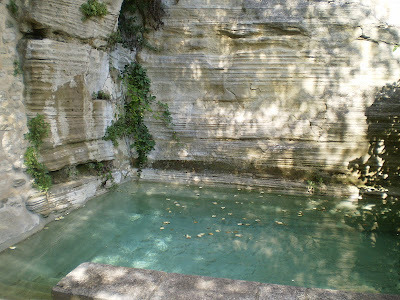 Jardin La Louve is situated on the south facing side of the village of Bonnieux. 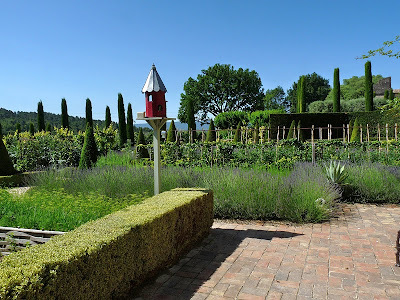 The conception of the garden started in 1986 when its creator, Nicole de Vesian, a fabric designer and stylist for Hermes, decided to construct the garden. 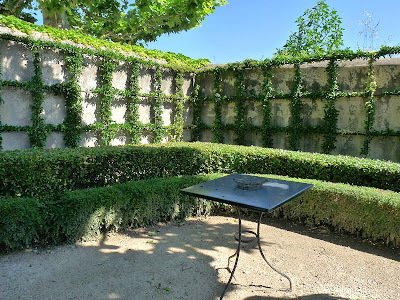 She mixed different textures and colours for contrast and constructed benches, walls, alcoves to give interest to the garden, very few flowering plants were used. When she turned 80, she sold the property to Judy Pillsbury, an art dealer, who had an interest in the area and loved the garden. 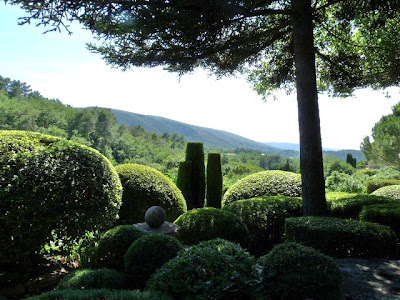 Judy Pillsbury continued in the same tradition of pruning the evergreens into a shape but introduced a few features of her own. 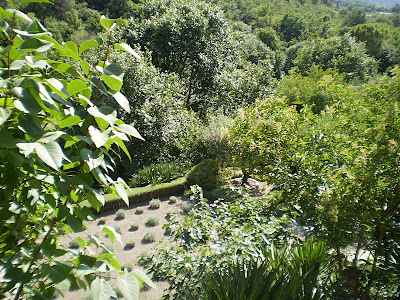 It is a very peaceful, very well maintained garden, a little haven in busy Bonnieux. Two gardeners look after the garden in the pruning season, with one gardener coming in every morning. 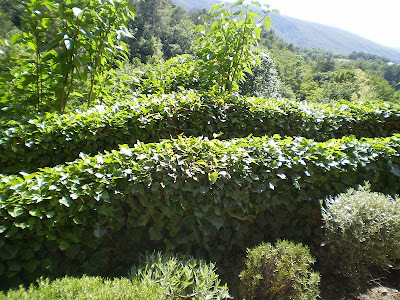 As is shown in this garden, virtually every evergreen shrub can be pruned into a shape. Even Feijoa sellowiana (Acca sellowiana) a fruit tree with lovely flowers, in this garden is a rounded bush. Abelia x grandiflora, Bupleurum fruticosum, Buxus sempervirens, Caryopteris x clandonensis 'Kew Blue', Choisya ternata, Cistus's. Elaeagnus x ebbengei, Euonymus communis, Feijoa sellowiana, Myrtus communis, Ligustrum japonicum, Lonicera nitida (the poor man's Buxus, grows faster and is cheaper), Osmanthus x burkwoodii, Phillyrea angustifolia, Pittosporum tenuifolium, Pittosporum tobira, Rosmarinus officinalis, Santolina chamaecyparissus, Sarcococca ruscifolia, Taxus baccata, Teucrium polium, Trachelospermum jasminiodes, Viburnum tinus. 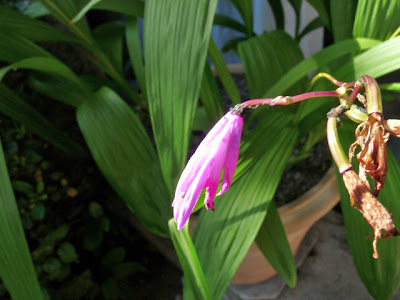 Two tubs around the house were planted with the Orchid "Bletilla striata". Photos: Elisabeth Boutevin, Jacqueline Hodkinson, Gerda Nagtegaal. 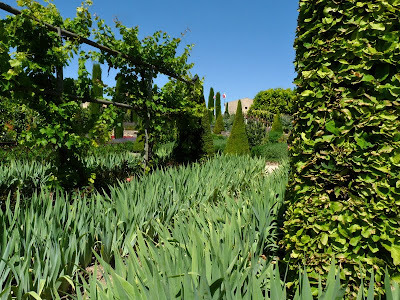 The first visit on our 2 day tour was to Chateau Val Joanis - a wine chateau (Cote du Luberon) on 400 hectares, 1.5 km from Pertuis. The Chateau was rediscovered in 1977 by the Chancel family, who undertook the task of restoring it to its former glory. 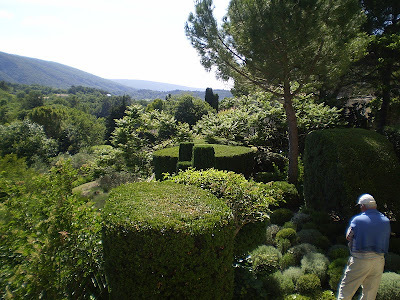 The Chateau was once the property of Jean de Joanis, secretary to King Louis III of Naples. 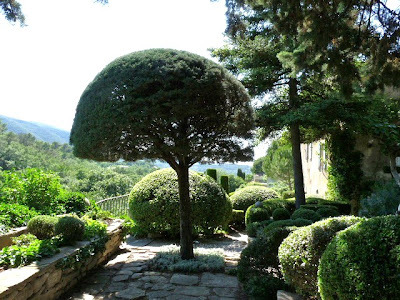 Cecile Chancel with the help of garden architect Tobbie Loup de Viane drew up the plans in 1978 to create a potager reminiscent of the potagers of the 18th century. 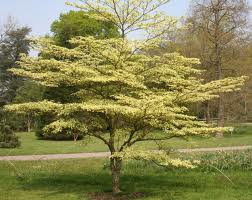 Ornamental but at the same time producing all the family's needs i.e. 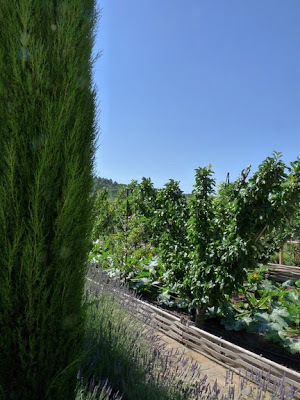 vegetables, fruits, herbs and flowers. A bit like a formal English cottage garden, but on a large scale. 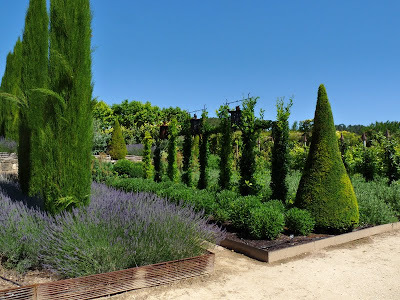 In 1980 they started the project, in 1990 the garden took its actual form and in 2005 the garden received the honour of being listed as a "Jardin Remarquable" and to top it all in 2008 it became "Jardin de l'annee 2008". 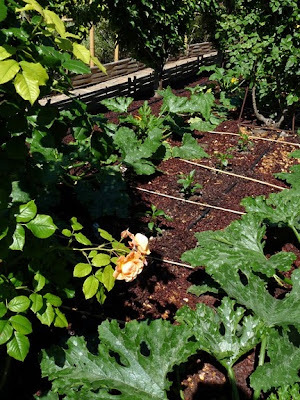 The garden is devided into 3 terrases: The potager; Roses and trained fruit; ornamental trees. 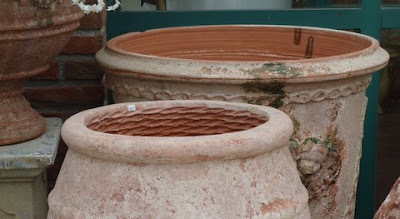 To cover cheap pots, a strip of narrow dark tinted bamboo rods (the ones to cover a pergola) are fixed around the pot. A metal framework supporting tightly clipped Pyracantha to surround the framework structure. 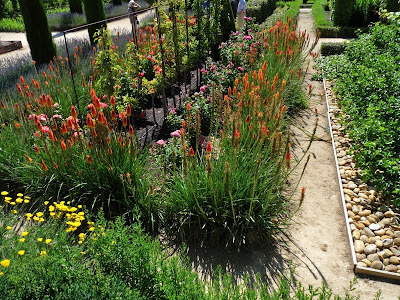 Between the beds of the potager, hard paths were created and the beds were surrounded by small pleated metal screens. It has a rich brown colour; it suppresses weeds and retains moisture; it repels slugs and snails once it has been watered or rained on as it forms a crust which binds the mulch together and this repels them. Our guide mentioned that the optimal age for a vine is 40-50 years old. By 80 years they have to be removed as they have to be treated so often it is uneconomical to keep them. 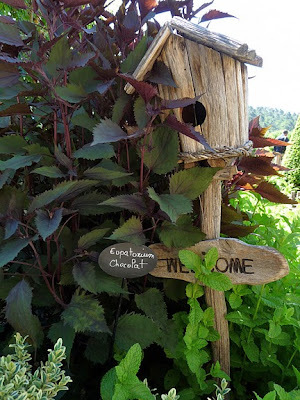 Eupatorium rugosum "Chocolate": made a very attractive contrast with the mint; attracts bees, tea made from the root was used by the native Americans to treat worms, colds and as an external wash for sores. 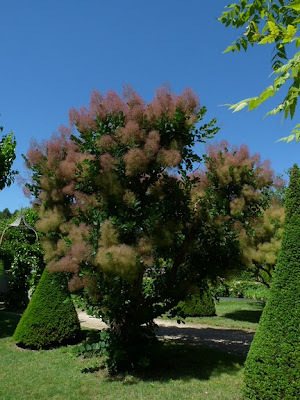 Cotinus coggygria: the nicest one I've ever seen. 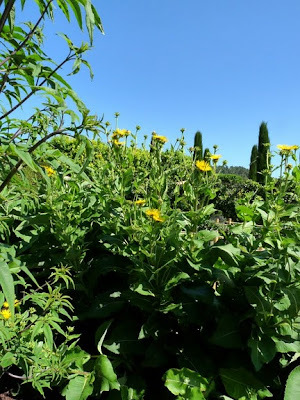 Inula magnifica: the roots of a close relative "Inula helenium" were used to treat bronchitis.